One of the charming and most frequented places, Jaipur is an invaluable splendour of India. It is one of the few places where one can delve deep down the layers of time and learn in detail about the history of the country. Also known as the Pink City, this marvellous land of palaces, forts and ancient monuments is all a history lover would need to define something like a paradise. So, if you are a traveller, then you must have added Jaipur to your bucket list. Isn't it? But, how well do you know the beauty of Jaipur? The following 7 intriguing facts about Jaipur will certainly leave you amazed, thereby, compelling you to pack your bags as soon as possible. Considering the beauty it harbours, it is no wonder the travel experiences gained within the boundaries of Jaipur are always perennial. Let's move on and learn some interesting facts about Jaipur. For Jaipur, which has been touted as one of the royal cities in India, housing luxurious and lavish hotels is common. But do you know Jaipur is also home to some of the famous hotel suites in the world? Yes, in the entire world! The Raj Palace Hotel has a presidential suite for about US$ 50,000. Well, this is something not everyone can afford to experience. Doesn't it fascinate you to plan a trip to Jaipur now? If you think Chandigarh is the first-ever planned city in India, then you certainly need to correct your facts. Jaipur is believed to be the first planned city in the country as it was completed in the year 1730. The fact that Jaipur is the only city that has been planned as per the rules and regulations of the Vastu Shastra and the Shilpa Shastra will certainly amaze you. Did you know that Jaipur was constructed within a period of 4 years? 3) Why Is It Called The Pink City? We all know Jaipur as the Pink City. But have you ever wondered how the name "Pink City" captured the frame? To your surprise, the city was painted entirely in pink colour in order to honour and welcome the visit of Edward, the Prince of Wales. It was done in the year 1876 by Maharaja Ram Singh and since then, Jaipur has been called the Pink City of India. 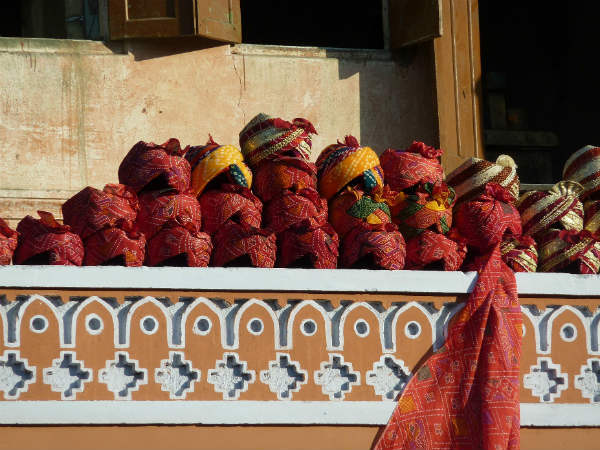 Most Read: How To Explore The Beauty Of Jaipur In Just 24 Hours? Jantar Mantar is one of the two UNESCO World Heritage Sites in Jaipur, the other being the Amer Fort. Therefore, it has gained popularity all over the world. It is a complex of 19 architectural astronomical instruments which were built in the year 1734 by the king of Jaipur so that astronomical positions of the solar system could be observed with the naked eye. Hence, it wouldn't be wrong to call it one of the architectural wonders of the world. Commenced in 2006, the Jaipur Literature Festival is the world's largest free literary festival which is attended by people from all over the world. From writers to filmmakers, lyricists to novelists, it witnesses thousands of artists from several countries. The last edition of this grand festival was celebrated from 25th to 29th January in 2018. If you are looking forward to illuminating your mind and acknowledging the beauty of literature, then there cannot be a better place for you than this literary festival. Over a period of time, Hawa Mahal has become one of the most recognised historical monuments in India. Hence, it is a synonym to Jaipur today. Therefore, a trip to Jaipur is always considered incomplete without capturing the captivating beauty of this grand structure. Do you know this architectural marvel has a total of 953 windows? Yes, you read that right. It is called Hawa Mahal (the Breeze Palace) for a reason. It was constructed in the late 18th century. Jaipur is a part of the Golden Tourism Triangle of the country; the other two cities that form this triangle are Delhi and Agra. It means that Jaipur is one amongst the most visited places in India. After all, it is the land where one can feel the essence of a royal aura.